IF COLLECTED PREV 50% VOUCHER AND COLLECT NEW WILL GET FOR ONLY £3.90 !!!!! Athletes, Computer Users, for anyone who want to relieve fatigue, Pain and relax Muscle. 1.Cover: Luxury PU leather with soft durable Mesh. 2.U-shape ergonomic design perfect to use for Neck, Shoulder,back, Calfs, Legs, Feet Massage. 3. 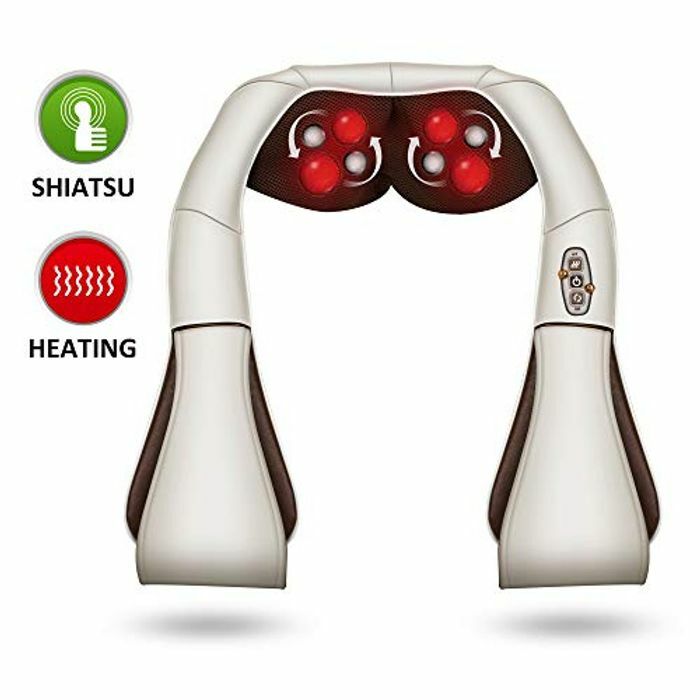 8-Kneading Nodes to provide comfort Shiatsu massage experience. 4. 2 Shiatsu Rotating directions can be changed by Manually or Automatically. 5. Armrest design to free hands and Arms, and may adjust Massage pressure as desired through pulling it. 6.The massage Kneading heads with Heat function to provide heat therapy for better blood Circulation, independently controlled. soften the massage pressure when feel the kneading too rough. 8.Set up an Auto 15 minutes timer, the massage will switch off automatically after 15 minutes. 9. Easy to operate through pressing the Button on Control Panel. 10. Use at Home, Office, and in Car, AC home adapter and Car adapter included. 30 DAYS MONEY BACK for return for any reason. 90 DAYS REFUND AND EXCHANGE If not complete satisfied with your purchase, simply contact us by email to make a replacement or a full refund request. £6.62 for me. I will hang on for a freebie rather than spend the money. I could do with a neck massage though! Shrice Working away first part of the week...only time for odd comment. My brother did the watching and ordering for me....didn't find out til this morning. Hope you'll get one soon! Shrice No chance... he'll upset too many people! NeilCarter if he had stacking deals, I’ll take it! Shrice Don't think he's got the patience...! Thanks for the tag ommacross19 £3.89 for me. Could have held on possibly, but it's a great price, so I couldn't resist!